This video showcases Jim Mortensen, a "gypo" miner for nearly 40 years in a deep, underground silver mine in the west. Jim is paid for what he produces and consistently out-produces everyone else in the area. He has never lost a day to a lost-time injury. In the video, Jim explains to a young miner, Ted, what he has learned over the years. He tells young Ted how to survive and how to do the job right. He discusses such things as proper work practices and personal protective equipment, and at the same time, provides valuable lessons on what it means to be a hard-rock miner. Jim is a master and is highly credible as a trainer. 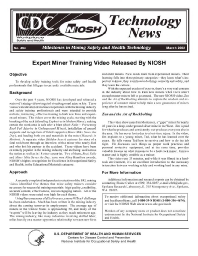 This video runs 33 minutes, and while it was filmed in a hardrock environment, it's an excellent introduction to the necessary interaction between working safely and working hard in any mine.